This could be an invitation to fresh thinking about all kids of stuff. What’s the first thing you think of when you see this banner? I was thinking: This could be an invitation to rebel against the nutty system by which tennis players keep score. Why continue with this nonsensical progression of love, fifteen, thirty, forty and set? If it takes at least five points to win a set, how about counting from one to five? Would that be too simple? 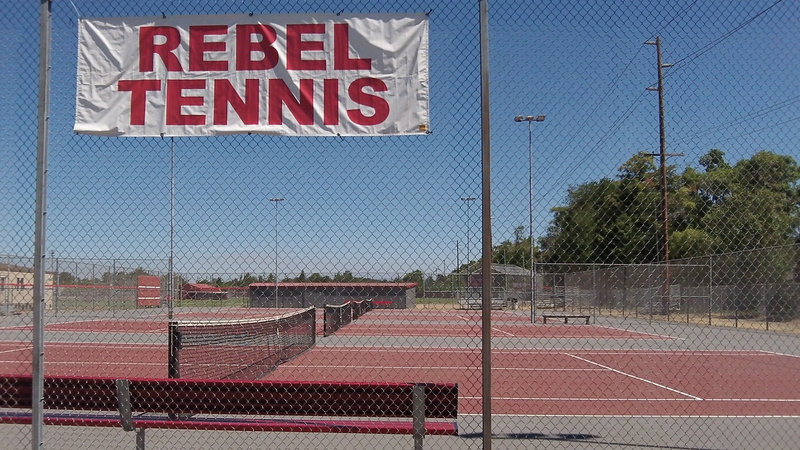 Alas, I don’t think the tennis Rebels at South Albany High School have any intention of rebelling against an outmoded system of scoring, or against anything else as far as I know. The nickname of the school teams and the associated logos and artwork have been the subject of a couple of stories in the press lately. First there was a story in The Oregonian a few weeks ago, followed by one with a different theme in the Albany paper Sunday. The name, of course, dates from when South was created as a counterpart to what was then Albany Union in 1971. At first there also was Confederate imagery, but that has been largely dropped in the intervening years. As for the school teams’ name, I hope it stays, perhaps even as an inspiration and a challenge to the next generation. It’s not as though there aren’t plenty of things to rebel against. Like what, you ask? Like, for starters, the degree to which we allow communications technology to run our lives. Or like presidential politics, which used to be merely mediocre and now, thanks mainly to Trump, are being debased to the level of farce. Like “reality shows” on television and other forms of alleged entertainment. Rebel against technology? Easy to do, if for no other reason than being connected all the time is too dang tiring. Rebel against reality TV? Easy to do, but I still have soft spot in my heart for Honey Boo Boo. Rebel against Trump? The 20% that support Trump won’t let this happen until the field is winnowed and he loses the primaries in New Hampshire and Iowa. Like, we’ve got a long time to wait, you know, for that to happen. How about the repeated use of “I mean”, I mean, like he goes—-. Oral communication is a fading art. While in the Navy I attended a school where everyone was required to give oral presentations without using “Uh” or “Ah”. Whenever that occurred the class would loudly proclaim “Uh” or “Ah”. It only took two or three presentations before you stopped. Perhaps we should do that to present day orators and in every day conversations.